In your HubSpot blog, you can set up instant, daily, weekly, and/or monthly subscriptions. 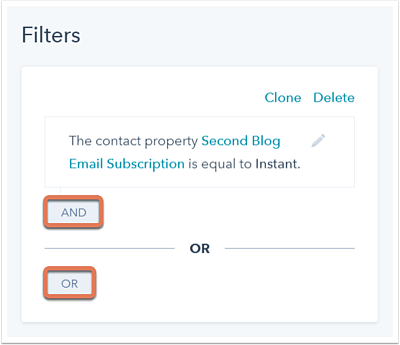 Depending on the options you enable, HubSpot will automatically create separate lists to segment contacts who subscribe to each notification frequency. These lists are then used as the recipient lists for the blog's notification emails. Please note: it is not possible to edit or remove the [Blog] Email Subscription contact property criteria in a blog subscriber list. You can add new, additional criteria, but you cannot remove the [Blog] Email Subscription contact property criteria. If you do, the list will revert back to the original criteria. Locate the blog subscription list(s) to edit. The names of these lists have the naming convention: [Subscription] Subscribers - [Your blog's name]. Click the name of the list. The list's original rule will be Contact property | [Your blog's name] email subscription | is any of | [Instant, Daily, Weekly, or Monthly]. This rule must remain; do not edit nor delete it. You can add other criteria to further segment contacts for this particular blog email subscription by clicking OR on the left-hand side. If you want to add rules which will apply in addition to the original email subscription frequency role, click AND. Learn more about AND vs OR list criteria. After adding your additional criteria, click Save in the upper right.